Your family will love these coconut chicken tenders and making them is so easy, especially when you follow the step by step instructions on the Appetites App! To be honest, I do not buy any chicken nuggets or tenders, ever. When my kiddos were very young, they took such a liking to them, that they would not eat any chicken I prepared. Thats when I made the decision to stop buying them, and I’m glad I did. In the beginning, I didn’t have much luck making them at home because I didn’t want to fry the chicken. This recipe was so easy and so good, that I wish I had it back then! If fact, they came out so perfectly, that my husband thought they were store bought – until he tasted them!!! 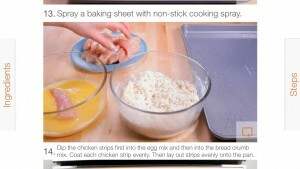 My 10 yr old was exploring the app this afternoon and came across the recipe. She enjoys cooking and asked if we could try to make these chicken tenders. I didn’t have the exact ingredients on hand, so we improvised with what we had. The instructions were so simple, that she was able to follow along easily and since she watched the video first, she had a better understanding of the whole process! The video is broken into segments so you can stop in between to gather ingredients and supplies. First, you will see all the ingredients laid out. Then there will be step by step instruction as you prepare the oven, the chicken and mix the ingredients for the coating. Combine ingredients in a small bowl and set aside until chicken is done. Line a baking sheet with foil, shiny side down, then lightly spray with cooking spray. Mix dry ingredients in a shallow bowl, then beat the eggs in a separate bowl. Dip the chicken breasts in egg, then coat in bread crumb mixture. Lay the strips on the baking sheet, and make sure they are not touching. Place baking sheet in the oven for 10 minutes. Now flip the tenders and return to oven for 5-10 minutes. Check after 5 min for doneness and be sure not to overcook so the chicken does not dry out. Remove from oven and serve with dipping sauce. Tomorrow she will take leftover chicken to school with a salad for lunch! The Appetites App recipe is called Hawaiian Coconut Chicken with Carrot and Cabbage Salad. The recipe, as is, looks amazing and I can’t wait to try it. I did not have any cabbage so I was unable to make the salad shown, so instead, I served a garden salad and rice on the side. We didn’t have the orange marmalade called for in the dipping sauce, so my kiddo created this Pineapple BBQ dipping sauce instead. It tasted so good! Since we spontaneously decided to make this recipe, I wasn’t fully prepared, but next time I will prepare in advance! I will use this App again in the near future. What I really loved about it was how simple it was to follow. At dinner, we were talking about how Appetites worked and it really intrigued my husband and other child. We talked about cooking another meal together, as a family. The part they loved was how all the steps are simply shown and they felt confident that they could follow along without depending on me for instructions on prepping and cooking. Appetites can create ANY recipe for any theme or holiday you need! Appetites is unique because it moves at your pace, is shot from the point of view of the chef and includes the Ingredients on Demand feature. Simply order the ingredients that morning for a same day delivery! This service is currently offered in Austin, Boston, Chicago, Los Angeles, Philadelphia, San Francisco, Seattle and Washington DC. Keep an eye out for additional cities coming in the near future! I will use this App again in the near future. You can download this fabulous app HERE. * This is not a sponsored post and I have not been compensated. All opinions are purely based on my own experience using the Appetites app. Yum yum yum. This is making me hungry now. Love the idea of coconut! Love the crispy coconut topping and my kids would love them! I would totally make these for my mom! She loves coconut! She’s want these on a Chinese Chicken Salad as well! Thanks for the recipe! These look so good! Thanks for the recipe! These look delicious and healthy! I can’t wait to try them for dinner sometime. These chicken tenders look perfect!! I love making my own rather than getting them from a box so I am really keen to try your recipe. I really like the pineapple in the dipping sauce – what a great idea! 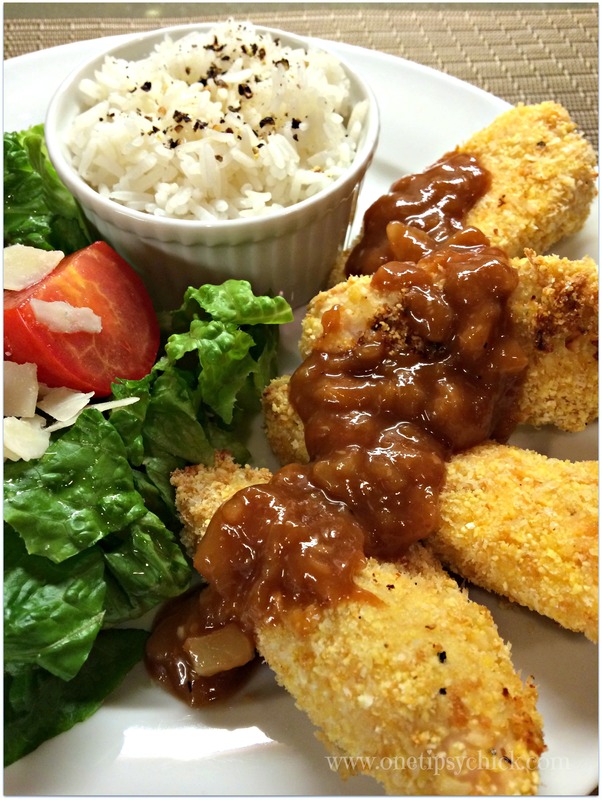 What a wonderful combination of flavors for a crispy chicken dish! 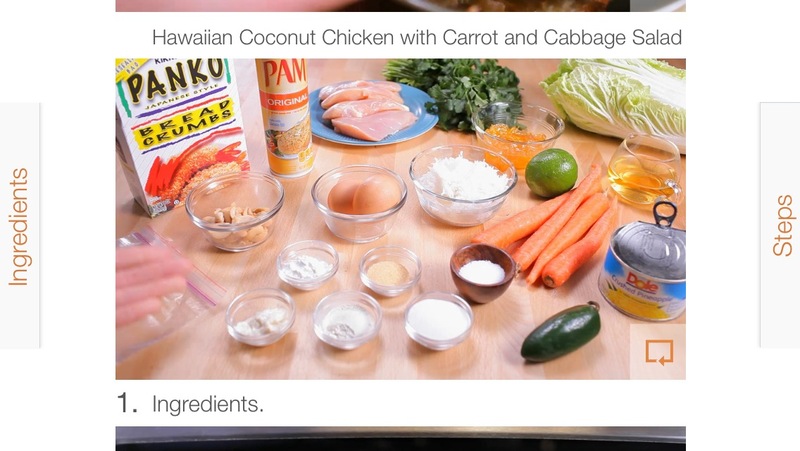 Coconut Chicken Tenders sound so delicious! I can’t wait to try this asap!! Thanks for sharing ! Looks so amazing! I love Coconut Shrimps, so I know I will love these just as much. I’ve never thought of using coconut as breading but I love that! Thank you so much for linking up at Tasty Tuesday! Your recipe has been pinned to the Tasty Tuesday Pinterest board! Please join us again this week!